Trump Spoke At A Civil Rights Museum. 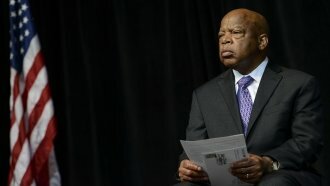 Civil Rights Leaders Boycotted. Some civil rights leaders didn't think Trump should have attended the grand opening — so they held their own event. President Donald Trump attended the grand opening of the Mississippi Civil Rights Museum on Saturday, but his attendance has sparked controversy and garnered criticism from civil rights figures. "The Civil Rights Museum records the oppression, cruelty and injustice inflicted on the African-American community, the fight to end slavery, to break down Jim Crow, to end segregation, to gain the right to vote and to achieve the sacred birthright of equality," Trump said at the event. Trump remarked on the successes of the civil rights movement, but some advocates say Trump's actions as president run counter to some of those successes. The president of the NAACP said on Tuesday that Trump has reinforced voter suppression and created a "racially hostile climate." Rep. Bennie Thompson said Monday that the president's budget cuts "disproportionately impact people of color" and are viewed as reminiscent of Jim Crow. Neither the NAACP president nor Thompson attended the grand opening of the civil rights museum. Instead, they held their own event at the Smith Robertson Museum, which also celebrates the history of African-Americans in Mississippi. In a statement, the NAACP said it would honor the legacy of the state's civil rights icons by "speaking truth to power and calling out this administration's divisive policies and its pull back from civil rights enforcement."